DavidNews HYIP blog - News & Reviews: Is allhyipdata.com something similar to allmonitors.net? The looks are important, right? Especially if you try to upgrade something that is already existing. 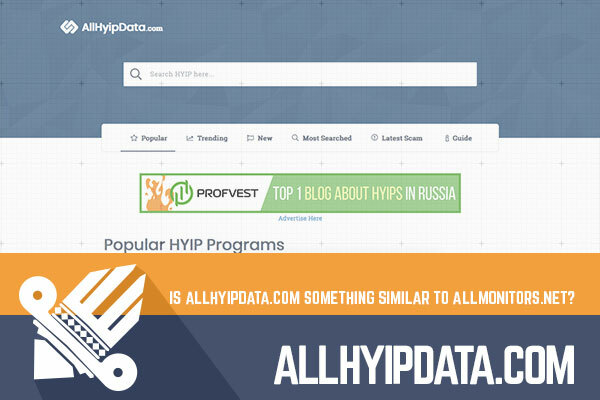 Allhyipdata.com has used the well know layout but in a more clear and simple way – a search box on top, followed by the list of the most popular HYIP programs and the footer with general info. My first thought was that allhyipdata.com has done a great job creating such a minimalistic website that doesn’t blow your mind each time you check the status of a HYIP. But then I understood what is the key of this aesthetics – the ad placement or positioning. At the moment ads are placed at the top and at the bottom of the pages – if it is going to stay this way, the minimalistic aesthetics will remain. If demand for ads increase on the resource or allhyipdata.com slightly changes their advertising approach, it will soon look like the well know allmonitors.net. Allhyipdata.com offer five categories – popular trending, new, most searched and latest scam. All in all the listing approach doesn’t really differ from allmonitor.net (the only difference is that allmonitors.net has a category named “Markes” yet allhyipdata.com – a category named “The most searched”). But does it really make a difference? No, it doesn’t. On each category page, allhyipdata.com provides a short description to show exactly how the particular category is made up. And this is where allhyipdata.com gets interesting or different – they have developed a star raking system to rate the HYIP programs. For sure some will definitely start question the validity of this assessment and it's totally fine, yet for many, this will be an easy way to perceive the information they are looking for. Basically, the star ranking system is based on total investments, invested in this week, number of monitors, monitor statuses and user feedback. On the category pages, you can find the overall rating for each program 1-5 stars. Weirdly enough the programs aren’t arranged in descending order starting from the highest rated programs. Since the star ranking systems seem to be “ the thing” for allhyipdata.com, this is what I was waiting for. Yet a more detailed rating is available on the individual HYIP pages. On the section “HYIP rating” you can find the data for investments (total, weekly), a number of monitors, monitor statuses and user feedback and corresponding rating in stars. I have to admit that I’m not completely sure about the methodology they use to convert data into the star rating. However, feel free to take a look at it yourself. Individual HYIP pages is another feature that I wanted to emphasize. If the category pages don’t really differ from other similar resources, then allhyipdata.com have made it clear and simple, at the same time providing information that an investor might want to see. In short, each individual HYIP page includes the HYIP rating block, program details, a comment section, investment calculator, RCB offers, investment and monitor block. If an investment calculator is a handy feature in such resource, yet it's not something that makes this resource to stand out. However, the combination of all the aforementioned features makes this resource a bit different than the similar ones. Data visualization seems to become more and more popular in the HYIP world as well. Allhyipdata.com have developed graphs or how they call them - visual tools, to provide insight into the HYIP programs. For example, the monitor graph allows seeing the number of monitors a program has had and to track if it still attracts new monitors. Likewise, on the individual HYIP pages, you can find an investment graph that shows the total investment by the RCB offers. Is allhyipdata.com the next big for searching HYIP programs? And is it somewhat similar to allmonitors.net? The path they have chosen is clear – a contemporary approach on how people search and perceive information. And this what makes it different from other similar resources. Again, are HYIP investors willing to use the garphs and rating systems to choose the right program? Or will the investors stick to the old-school methods? Feel free to share your thoughts in the chat box below.